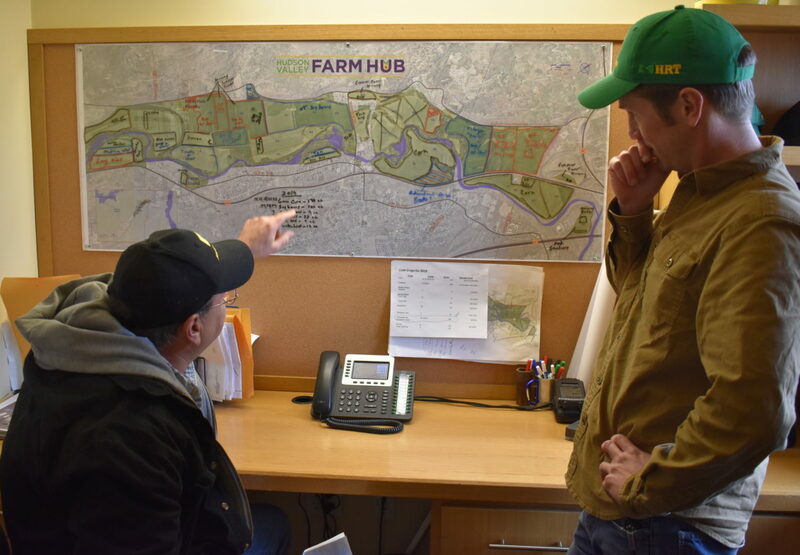 Farm Manager Eddie Clevenger and Production Manager Jeff Arnold examine the crop map in Eddie’s office as they prepare for a busy season. Editor’s note: Farmer’s Corner is a photo-essay that spotlights the behind-the-scenes of farming from the grower’s vantage point. For this first feature, we focus on the wall-sized map of the Farm Hub that serves as a blueprint for the growing season. This piece is contributed by Jay Goldmark, field crops production manager. “A map of the farm is mounted behind a thin sheet of plexiglass, which, over the course of the winter months, we trace, write, scribble, erase, rewrite, and redraw the crop plan for the coming growing season. Viewed from several steps back, the outline of the farm resembles the shape of a butterfly, wings unfolded, with Wynkoop Road running the length of its abdomen and thorax.